This blog post will give a critical account of exactly what altitude training is, what the different forms of altitude training are, as well as the benefits and implications of its use within sport. So what is altitude training? Before I discuss what altitude training is I think it’s important to understand exactly how our bodies work, and in particular how endurance cycling performance is entirely based on how our bodies use oxygen. Whilst riding we are constantly breathing in air that contains oxygen, our lungs then pass this oxygen into our red blood cells, which then pass it through into our muscle tissues (Mutavdzic, 2013). 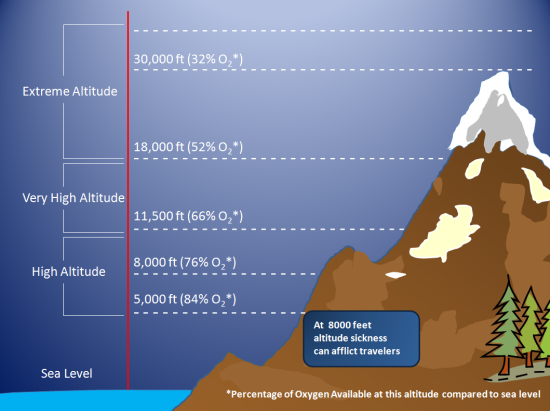 It is a common misconception that at higher altitudes there is less oxygen (Wilber, 2011). In actual fact, the oxygen levels are the same whether at sea level or at 5000m, yet the air pressure is lower at higher altitudes which results in the air becoming ‘thinner’ and thus meaning each breath we take contains less O2 particles than at lower altitudes (Wilber, 2011). Feeling winded and gasping for air are common symptoms of this (Epthorp, 2014). “I struggled to adapt, suffering headaches and extreme lethargy” is a comment made by The Gallivantista who has this great blog entry on the west coast of Tenerife and Mount Teide. However, our bodies are extremely sophisticated and sense the lower levels of oxygen available; this triggers the release of Erythropoietin, known as EPO, which is produced by interstitial fibroblasts in our kidneys. The EPO hormone triggers the release of more red blood cells which have the capability of carrying more oxygen to our muscle tissues (Garvican et al, 2012). So what does this mean in relation to endurance cycling performance? Well due to the body compensating for the lower air pressure level and increasing red blood cell production, when we come back down from altitude our bodies are more efficient in the fact that we have a greater ability for oxygen delivery to the working muscles, thus allowing us to work harder for longer (Wilber, 2011). This stresses that there is clearly a performance advantage for those who train at altitude over those who don’t and there are several forms of altitude training. Altitude training has long been at the forefront of coaches training plans within endurance sports (Wilber, 2011) and it has been found that training must be completed at least 2200m above sea level for the effective EPO response to occur (Gore et al, 2001). Furthermore, it is argued that for adaptations to take place it requires at least four weeks, 16 hours a day, exposure to hypobaric (altitude) conditions, meaning that going abroad for a two week training camp has very minimal effects in relation to altitude training (Wilber, 2004). Live High – Train High (LHTH) – This is the most traditional form of altitude training and involves both living and training at high altitude before reaping the benefits when competing at sea-level (Barker & Hopkins, 1998). Live High – Train Low (LHTL) – One argument is that athletes cannot train as intense at high altitudes so this form of training has been developed so that we live at high altitudes, but descend to train at low altitudes. This means that athletes can train much harder whilst still reaping the benefits of living at high altitude (Wilber, 2011). Live Low – Train High (LLTH) – This form of altitude training involves living at sea level, but training at altitude in order to gain the adaptations. Training camps are a perfect example of this and it is much more realistic for non-professional athletes to train in this way due to cost (Griffin, 2013). Two very common ways of training at altitude without actually travelling up a mountain are hypoxic masks and tents. The hypoxic tents are designed so that athletes sleep for at least twelve hours a night in the tent which controls the level of oxygen available to replicate being at altitude (Pupis et al, 2012), whilst the hypoxic masks are used whilst training on a static trainer which works on the same principle as the tent (Epthorp, 2014). Both of these methods are cheap alternatives that have shown positive effects in haemoglobin and hematocrit levels (Pupis et al, 2012). 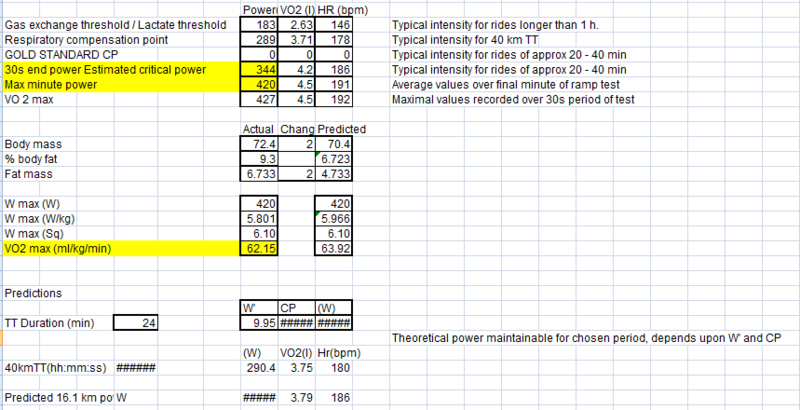 These results show that there is a clear increase in all the power data after the training camp at altitude. For example, this athlete was capable of producing 420watts for his max minute power before an 18watt increase post camp. Additionally he produced 344watts for the 30 seconds end power before increasing this to 348watts after hypobaric training. These results also show that the increases in power were performed at a higher VO2 max, from 62.15ml/kg/min to 65.94ml/kg/min. This is hugely significant as it shows the greater oxygen delivery had a direct impact on the athletes power increase. Please note that tests would need to be carried out to see the effect of a 4 week training block at sea-level to accurately comapare this data and to say ‘yes this effect is due to the effects of altitude’. So there is a clear advantage in this form of training, so why don’t we all train at altitude? Well for anaerobic athletes their performance is unaffected as the ATP-PCr and glycolytic systems require minimal oxygen to perform (Romulo et al, 2013). Additionally it is believed that an increase in red blood cells only lasts for around fifteen days (Wilber, 2011) which is great if we are racing within that time period, but requires a long time to acclimatise to the altitude. In actual fact it takes 11.4 days per 1000m elevation to acclimatise (Wilber, 2011) and this makes this form of training very time consuming and expensive if you’re not an elite performer. Barker, A. & Hopkins, W.G. (1998) Altitude Training for Sea-Level Competition. Available: http://www.sportsci.org/traintech/altitude/wgh.html#highhigh. Last accessed 05/04/14. Bertuzzi, R., Nascimento, E., Urso, R., Damasceno, M. & Lima-Silva, A. (2013) ‘Energy System Contributions During Incremental Exercise Test’ Journal of Sports Science & Medicine. 12 (3) pp. 454-461. Epthorp, J,A. (2014) ‘Altitude Training And Its Effects On Performance – Systematic Review’ Journal Of Australian Strength & Conditioning’. 22 (1) pp. 78-89. Garvican, L., Martin, D., Quod, M., Stephens, B., Sassi, A. & Gore, C. (2012) ‘Time Course of The Hemoglobin Mass Response to Natural Altitude Training in Elite Endurance Cyclists’ Scandinavian Journal of Medicine & Science in Sports. 22 (1) pp. 95-94. Gore, C.J., Hahn, A.G., Aughey, R.J., Martin, D.T., Ashenden, M.J., Clark, A., Garnham, A.P., Roberts, A.D., Slater, G.J. & Mckenna, M.J. (2001) ‘Live High: Train Low Increases Muscle Buffer Capacity and Submaximal Cycling Efficiency’ Acta Physiol Scand. 173 (1) pp. 275-286. Griffin, B. (2013) Explaining The Science Of Altitude Training. Available: http://cyclingtips.com.au/2013/03/explaining-the-science-of-altitude-training/, Last accessed 05/04/14. Mutavdzic, V. (2013) ‘Basic Parameters Of Aerobic Training In Recreational Road Cycling’ Research in Kinesiology’ 41 (2) pp. 206-208. Pupis, M., Pivovarnicek, P., Tonhauserova, Z. & Pavlovic, R. (2012) ‘Various Alternatives Of Hypoxic Training’ Sport Scientific & Practical Aspects. 9 (2) pp. 25-33. Wilber, R.L. (2011) ‘Application of Altitude/Hypoxic Training By Elite Athletes’ Journal of Human Sport & Exercise. 6 (2) pp. 271-287. Wilber, R.L. (2004) Performance at Sea Level Following Altitude Training. In: Altitude Training and Athletic Performance. Champaign: Human Kinetics. ← Do Global Positioning Systems Have A Future In Sport? Mike this is another great post and I think how you relate it to your own sport is brilliant. 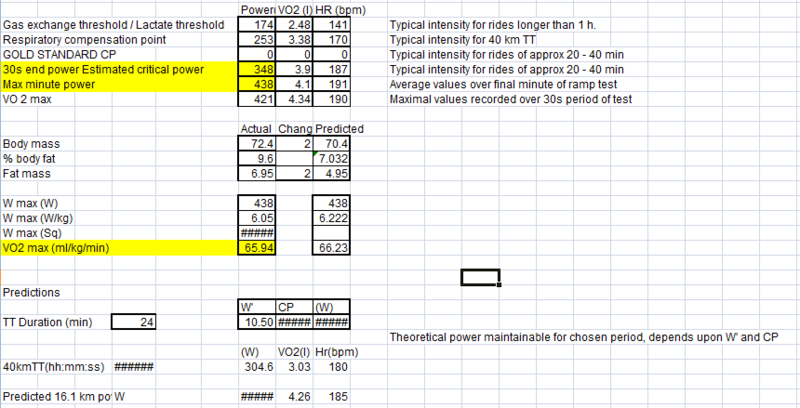 I really like the pre and post analysis of sending your rider to Tenerife too. Great post, great read!